Is any bottle of wine actually worth the best part of £2,000? We’re not talking about some rare 19th century gem fished perfectly preserved from the hold of the Titanic, but a newly released wine available for anyone to buy – at least anyone with the right bank account and perhaps the right wine merchant contacts too. It’s a question I pondered as I sped towards Gleneagles hotel in Perthshire, Scotland, where a very special occasion awaited: along with two other journalists I had been invited to the UK unveiling of the newest vintage, the 2000, of Krug’s most rare and expensive wine, the single-vineyard cuvée Clos d’Ambonnay. Only the fourth ever release of this wine from a tiny ‘clos’ – a walled vineyard – in the village of Ambonnay, just 5,000 bottles are produced and the lucky few who can afford and gain access to it will pay at least £1,650 per bottle according to wine-searcher’s cheapest stockists. I’ll return to the philosophical (not to mention theoretical) question of whether I would pay so much for this or any other bottle of wine later, but for now let’s concentrate on Krug and this most memorable of tasting occasions. Arriving for a dinner at Andrew Fairlie’s eponymous restaurant within Gleneagles, Olivier Krug, right, greeted me warmly as always with a handshake and invitation to join him in a refreshing small beer before sitting down to enjoy Fairlie’s exceptional cuisine, matched to various Krugs, though not the Clos d’Ambonnay which was lined-up for the following morning. The dinner was a tour de force, with Andrew Fairlie’s brilliant food matched so intelligently and deliciously with the wines. Highlights? Most certainly the Krug Grande Cuvée matched to Scottish lobster, where every element of the dish – sweet Sound of Mull lobster flesh, lime, butter and subtle smokiness (the lobster shells had been smoked over whisky barrel chippings) – found haunting echoes in the wine. Roast pigeon with a confit of the legs was gloriously paired with Krug Rosé too, the dense but subtly earthy pigeon meat so succulently à pointe with the soft berries and hint of truffle in the wine. 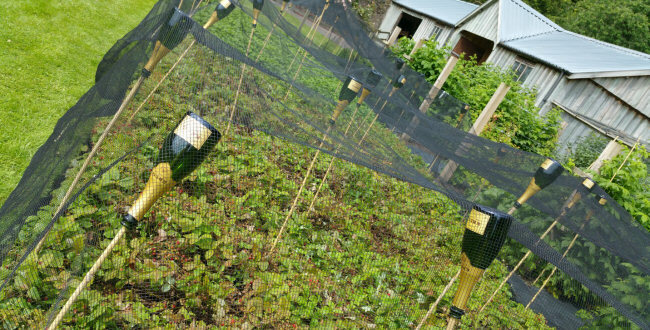 Historically Krug has woven a very romantic web around its flagship wine, the multi-vintage Grande Cuvée. It’s precise composition was never revealed, and the previous generation of Krug’s in charge, Olivier’s uncle and father, obfuscated in the most delightful Gallic fashion if you tried to press them on the blend, age and nature of components. But as I reported in ‘Krug Gets Naked‘ in 2011, the arrival of a new President in the shape of Venezuelan-born Margareth Henriquez heralded a new era of Glasnost for Krug, the company recognising that many of those selling, collecting and drinking their wines really did want to know a lot of this detail. Each of Krug’s wines now bears an ID number, which the drinker may type into a handy app to reveal the ‘secrets’ of the wine (download the app for Apple or Android from krug.com/krugids). Over dinner Olivier explained that Margareth had driven the change which he now clearly embraces with enthusiasm: “The ID number is so useful for sommeliers for example,” he says. “With this information they can explain the story of the wine. One restaurant in Paris sells three different IDs of Grande Cuvée by the glass so that customers can compare.” One thing has not changed across the generations: the Krug belief that their ‘multi-vintage’ Grande Cuvée is not the same as most house’s ‘Non-vintage’, because it comes from a different philosophy. “Krug was the dream of a middle-aged man – my great, great grandfather Joseph – who left his position with Jacquesson to follow a dream.” That dream, says Olivier was to make a new style of Champagne. Krug’s first single vineyard wine was the Clos du Mesnil, 1.84 hectares of Grand Cru Chardonnay which the family acquired in 1971. The production of the Blanc de Blancs Clos du Mesnil is around 12,000 bottles, and at the time it was as a radical departure for the blending maestros of Krug. It was not until the mid 1990s that Krug acquired its second Grand Cru site within an ancient walled ‘clos’, this time just 0.68 hectares of Pinot Noir. Today that is the source of the Blanc de Noirs Clos d’Ambonnay, around 5,000 bottles of which are produced. Our venue for the unveiling of the Clos d’Ambonnay 2000 was both magical and so perfectly sympathetic: Andrew Fairlie established his own ‘clos’, a walled Victorian garden on an estate 15 minutes drive from Gleneagles hotel, which today employs four full-time growers to supply his 2* Michelin restaurant with almost all the herbs, fruits, vegetables and edible flowers used in the kitchen. Clos d’Ambonnay is not made every year, and the new 2000 vintage is the fourth Clos d’Ambonnay made since the family acquired the vineyard in 1994. Olivier says “It is still an experiment,” but the decision to create a 2000 release of the wine was taken quickly on tasting the Pinot Noir which showed “aromatic intensity, elegance and balanced character without any excess.” The spring began well with good flowering in early June, but rainfall in July was four times higher than average, and a hailstorm hit, destroying some vines in the region. The wet weather meant that ripening was slow but August was sunny and dry and good weather sustained through to the picking which, for Clos d’Ambonnay, took place in just one day on September 29th. 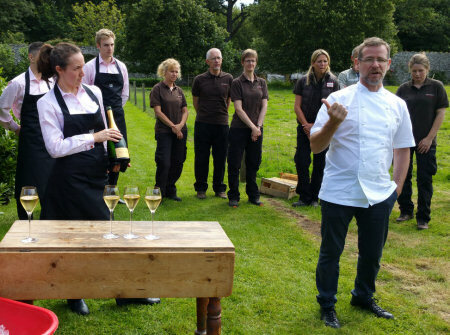 Having spent time wandering Andrew Fairlie’s secret garden and marvelling at the quality of produce being grown, it was a complete surprise when we moved though a small wooden gate to a further section of the garden, where tasting tables were laid out with glasses not just for 2000 vintage Clos d’Ambonnay, but all four vintages released to date – the first time ever that all four vintages had been opened and tasted side by side. A rare privilege indeed. Beautiful colour with some emerald glints and stream of miniscule bubbles across the glass. Lovely bruised fruit, bruised apple and hints of toffee. There is nuttiness, of hazelnut and some floral top notes. The palate is rich without being broad, with such a lime zest core of acidity and concentration. The mousse is persistent yet fresh and soft, the breadiness and nuttiness is there, but wonderful alertness and clarity. 96-97/100. A very slightly darker colour perhaps, a little more gold. Toasted wheat and hazelnut, toffee and cocoa, there’s more tension and a tighter fruit quality but burgeoning notes of cream and apple. The palate has a crew and soft mousse, and a tangerine brightness to the fruit. Glittering acidity that is pithy, dry and zesty, but the minerality is clear and the wine is endless. Lighter in a way than the 1995, but just so elegant, so perfectly in tune. Not as spectacular or showy as the 1998 for example, but this ultra-refined vintage could turn out to be amongst the best. 97/100. Again this appears darker in colour again, but still a glint of green and those tiny bubbles. A vinous nose, there is bruised apple and a gentle oxidative nuttiness and toffee. The palate has a rolling, creamy mousse that gives a luxurious feel. The fruit is buoyant and ripe, a touch of red apple, the bruised quality is there but cocoa and warm nutty flavours join the beautifully integrated acidity of the finish. Such gorgeous depth and harmony here. This is decadent, and the one I would open now if given the choice. 97-98/100. Gorgeous fresh colour with hints of emerald and buttercup yellow, and minuscule bubbles across the glass. Hazelnut and some bruised apple, a sense of wet river stone minerality, cream and a touch of something intriguingly herbal in the background. The palate has some serious luxury with the mousse creamy across the tongue, but there is cocoa and buttery Brazil nut flesh, the weight filling the mid-palate before a precision to the acidity that scythes through something like the 1996, the little toast notes filling underneath. A baby, but the components need some time to knit together. 96-98/100. See all stockists of Krug Clos d’Ambonnay on wine-searcher. During lunch after this extraordinary tasting, we were served the 2000 and 2003 ‘regular’ vintage cuvées of Krug. Both are delightful, very fine Champagnes, and yours for around one tenth the price of a bottle of Clos d’Ambonnay. My notes and scores for these wines follow, and you will see that if this was purely about crunching numbers and logical conclusions, there is no way that Clos d’Ambonnay is ‘worth’ ten times as much. And yet, and yet… If you will forgive me stepping into the poetic shoes of famille Krug for a moment, there is a point in art, in music, in every sphere of aesthetic appreciation, when calculators and abacus must be put away, and a whole different complex of sensibilities kicks in. I might choose to spend my £2000 on 10 bottles of Vintage 2000 rather than one of Clos d’Ambonnay 2000, but to drink even just one glass of Clos d’Ambonnay – like a glass of Romanée-Conti 1999, or Château Lafite 1961 – is an exquisitely intense and joyful experience that works on so many levels. The regular 2000 vintage Krug has a wonderful freshness and a subtle, tight character, with biscuit and brioche, but a delightful floral and soft herb quality giving layered complexity. Fabulous orange and lime sweetness and intensity on the palate, real mid-palate concentration and weight. The cream and gentle almond richness rounds out the finish, the salt and minerals and the juice of the lime acidity into the finish is marvellous, in a wine that has obvious cellaring potential for a decade and more – probably much more. 96/100. The earliest harvest since 1922 when temperatures were on average 28ºC over growing season. Beautiful buttercup and emerald hints to the colour. There is creaminess and there is delicate honey and hazelnut, even a hint of toast. The palate shows ripeness but also extraordinary clarity, a very harmonious and rounded wine, lovely integration, with composed, precise flavours pushing through to a very long and elegant finish. Plush, yes, but citrus-tight and long. Whilst technically it has lower acidity than the 2000, it does not feel like it in the mouth. 94/100.